The Federal Highway Administration (FHWA) is featuring a collection of five cost-effective pedestrian safety countermeasures in its Every Day Counts (EDC) initiative. Expanded use of these countermeasures, collectively known as "Safe Transportation for Every Pedestrian" (STEP), is expected to reduce pedestrian injuries and fatalities. Twenty-five states (including Tennessee) and the Virgin Islands plan to demonstrate and assess STEP countermeasures. Another 17 states and Washington, DC, expect to institutionalize STEP countermeasures by the end of EDC-4. Nationally, pedestrians account for over 17.5 percent of all fatalities in motor vehicle traffic crashes. In Tennessee, pedestrians have risen from 68 of 1,014 traffic deaths (6.7 percent) in 2012, to 101 of 1,041 traffic deaths (9.7 percent) in 2016. As of May 26, pedestrian deaths account for 45 of 380 traffic fatalities (11.8 percent) so far in 2017. The majority of these pedestrian traffic deaths occur at uncontrolled crossing locations such as midblock or un-signalized intersections. According to the National Highway Traffic Safety Administration (NHTSA), only 18% of calendar year 2015 pedestrian traffic fatalities occurred at intersections. These are among the most common locations for pedestrian fatalities generally because of inadequate pedestrian crossing facilities and insufficient or inconvenient crossing opportunities, all of which create barriers to safe convenient, and complete pedestrian networks. Pedestrian refuge islands reduce crossing distances and allow pedestrians to deal with only one direction of traffic at a time. Credit: www.pedbikeimages.org / Lyubov Zuyeva. Crosswalk visibility enhancements, such as crosswalk lighting and enhanced signing and marking, help drivers detect pedestrians — particularly at night. Pedestrian hybrid beacons (PHBs, also known as HAWK signals) stop vehicular traffic when pedestrians are present. PHBs rest in a dark state when not in use. Credit: www.pedbikeimages.org / Mike Cynecki. Rectangular rapid flashing beacons (RRFB) combine bright, rapidly flashing lights with standard crosswalk warning signs and pavement markings to provide drivers with active warning of pedestrians crossing the street. 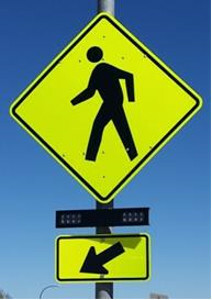 Credit: Evaluation of Pedestrian Hybrid Beacons and Rapid Flashing Beacons, FHWA-HRT-16-040. Road Diets, pedestrian refuge islands, and PHBs are all considered Proven Safety Countermeasures by FHWA. FHWA is also promoting Road Diets through EDC-3. The Tennessee Department of Transportation (TDOT) is developing a program that identifies high crash pedestrian corridors and intersections. Road safety audits will be conducted at these locations and countermeasures will be implemented. Other communities benefitting from the use of STEP countermeasures include Austin, Texas, where at least 39 PHBs are already installed and residents can request additional sites for them. In Michigan, the Department of Transportation (DOT) developed a Road Diets checklist to ensure smooth administrative procedures. 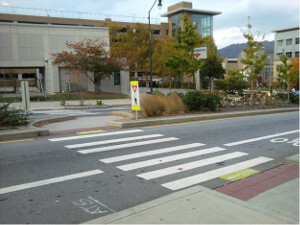 Countermeasures such as rectangular rapid flashing beacons (RRFBs), crosswalk lighting, and raised crosswalks are being promoted through FHWA's PEDSAFE, a tool that helps ransportation agencies diagnose and treat pedestrian safety issues. PEDSAFE includes numerous case studies that describe how communities across the country have implemented these safety improvements. The RRFB has been demonstrated to greatly increase driver yielding rates in several communities, including St. Petersburg, Florida. This EDC-4 effort will help more communities deploy these pedestrian safety improvements based on their specific roadway contexts and needs. It also aligns with U.S. DOT's Safer People, Safer Streets initiative and with other U.S. DOT efforts such as Ladders of Opportunity, which aims to provide people with safe, reliable and affordable connections to employment, education, healthcare and other essential services. STEP is also an important action in FHWA's Strategic Agenda for Pedestrian and Bicycle Transportation, which is a collaborative framework for pedestrian and bicycle planning, design, and research efforts being developed over the next five years. 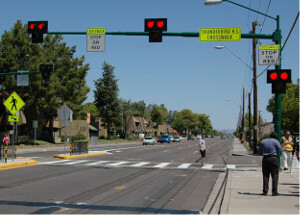 To learn more about the pedestrian safety innovations described in this article, please visit the FHWA website at (https://www.fhwa.dot.gov/innovation/everydaycounts/edc_4/step.cfm).